Final Fantasy IV for Nintendo DS features characters bearing personalities worth remembering, making this a game that keeps players interested for hours on end. 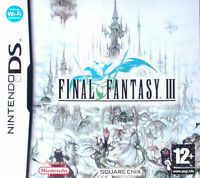 This Nintendo DS game allows a player to join Final Fantasy IV on a journey as he is stripped of his rank in the Red Wings of Baron and is sent to achieve his perceived destiny. Throughout Cecil’s journey, many characters join his side including some familiar faces from past Final Fantasy games. Final Fantasy IV features a new character customization interface that, for the first time in the Final Fantasy series, allows player to customize each character to the player's liking. Anywhere players take their Nintendo DS, the adventures of Final Fantasy IV can go too. This adventure game makes good use of the touchscreen capability of the Nintendo DS, as it includes mini-games that use the touch screen almost exclusively. When considering a new adventure game for a Nintendo DS, Final Fantasy IV is a great adventure option, thanks to its in-depth game play and interesting characters. Immediate payment of £23.11 is required. as an avid collector of Final Fantasy games, there was no doubt in my mind that I would enjoy this game, but it delivers so much more than I had initially expected, on this tiny little cartridge, you are given an epic and huge story, fully voiced with amazing graphics, if I was asked what was missing, I would have a long think and answer....."a second part?" luckily such a game is also available so there really isn't anything missing. if you like rpg's and huge amounts of game, this might just be perfect for you. Fantastic product, a must have in any game collection! Very good game. classic storyline, great gameplay. brilliant for rpg fans. adressess a lot of the niggles final fantasy users may have, great for seasoned and novice players of both final fantasy and rpg's in general. The game is really nice, it's entertaining, visually pleasing even if slightly simplistic. I am only around half way through at the moment but I'd say it's definitely worth a buy. In comparison to other more popular Final Fantasy games this does stand up, it may not be on the level of Final Fantasy VII, or as gorgeous as XIII, it doesn't have the same character connection that you get in X and it doesn't have the cracking humor of Final Fantasy IX but it is not without it's charm.